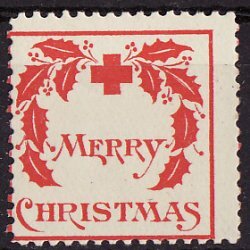 1907-1, WX1, 1907 U.S. Red Cross Christmas Seal, Type 1, Avg, No Gum. The 1907 Red Cross Christmas Seal was issued by the Delaware Chapter of the American Red Cross. 1907-1, WX1, 1907 U.S. Red Cross Christmas Seal, Type 1, Average, no gum. Size 19x19mm, perf. 14. Scan of front and back available upon request.